Review for The Ultimate Guide to Text and Phone Game, Makes the Difference between the Good and the Great. "Makes the Difference between the Good and the Great." 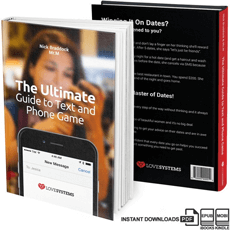 - The first chapter of the book deals with actually 'turning her phone number into a date'. THIS IS SO KEY! Imagine changing few tiny, little things of your game and getting twice as much dates out of your phone numbers. That's basically what this chapter deals with. Pure gold. Of course this is only a cursory example, Braddock and Mr.M go into GREAT DEPTH. Not only here, but in the WHOLE BOOK. This means, it's for everyone. The newbie and the experienced guy. - Introduction of the concept of 'fuses'. There's a difference between a girl, that is super on (short fuse) and a girl, that isn't that excited talking to you (long fuse). I've seen lots of dating science products and seminars and trust me, this book is a MUST HAVE. Not only does it give you tons of examples of things to write, but it also describes the 'matrix' behind all that stuff, so you know how to do it naturally after some practice. It's one of those products that makes the difference between the good and the great.